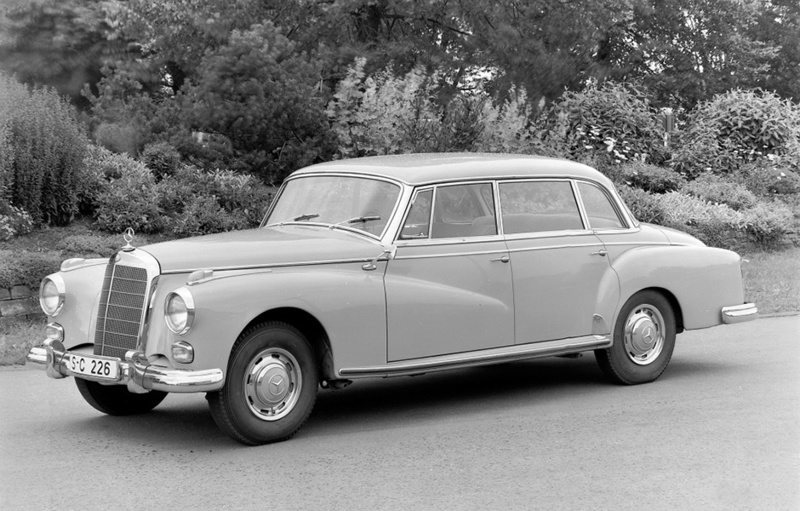 Mercedes-Benz 300d Saloon receives fuel injection in 1958 vastly improving power and refinement. In every epoch the future of the car needs strong innovations for safety and comfort. 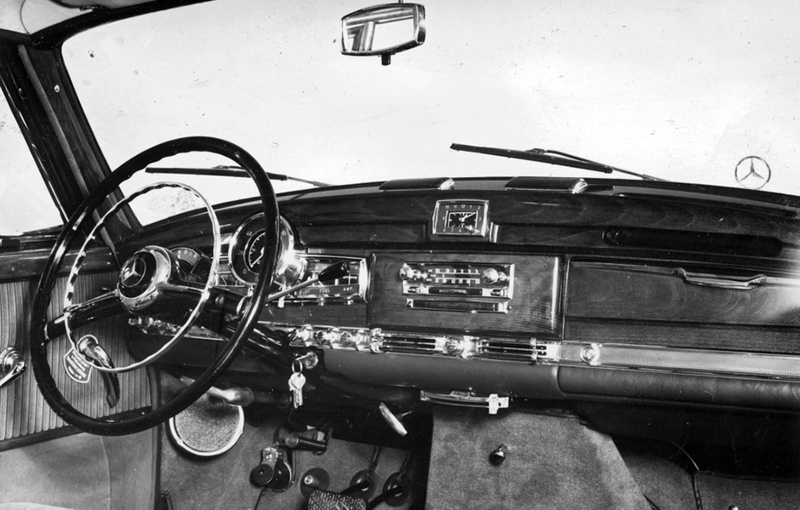 60 years ago Mercedes-Benz made headlines with a multitude of pioneering solutions in this field. They included from the seat belt as an optional extra through petrol direct injection in volume production to the power steering system and air conditioning system. The new products and features presented in 1958 in the passenger cars from Mercedes-Benz underlined the brand’s innovative power. In the 300 SL Roadster (W 198) the company offered seat belts for the first time, launched a power steering system and air conditioning as optional extras in the 300 (W 189) model and in the 220 SE self-supporting chassis-body structure (W 128) it established petrol injection in volume production. Also 60 years ago, on 2 July 1958, Mercedes-Benz made the patent application for the wedge-pin door lock with two safety catches under the number 1 089 664. The new design aimed to prevent the doors from breaking open or jamming in an accident. A year later it was used in series production in the “tail fin” saloons (W 111) with the revolutionary safety body. Another important optional extra was available in the Mercedes-Benz passenger cars as of June 1958: the childproof door lock. 300d ‘Adenauer’ cabin becomes safer with the availability of seat belts. The seat belt restraint system was continuously enhanced at Mercedes-Benz. 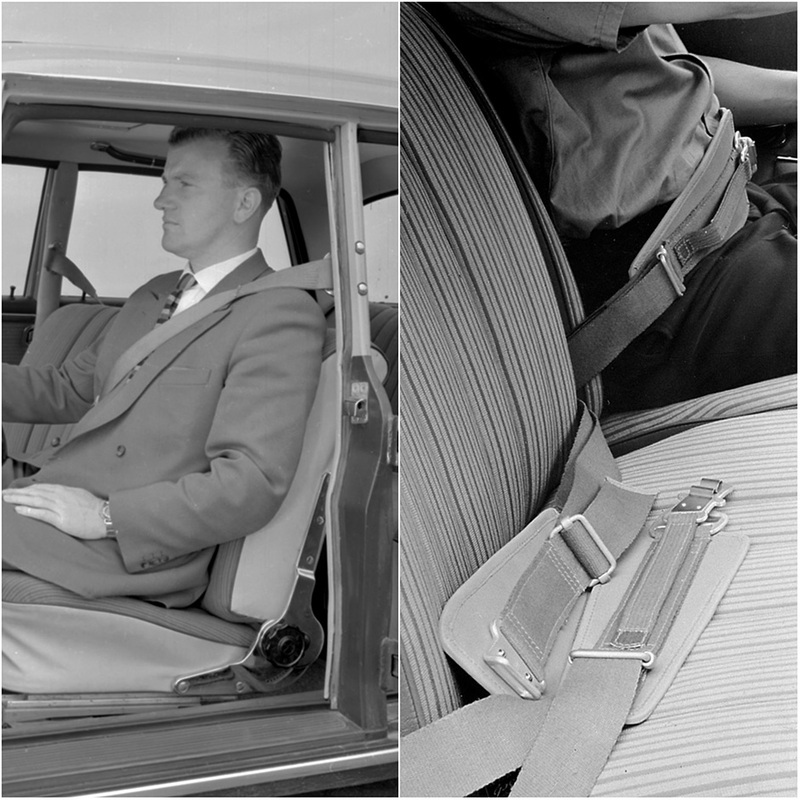 The waist/lap belts secured to the vehicle body initially became shoulder belts with two fastening points (from 1961 for all vehicles with belt fastening on the front seats) and then the three-point seat belt. It asserted itself at the end of the 1960s and became the automatic seat belt in combination with an inertia-reel function. This was launched in 1973 in all Mercedes-Benz passenger cars as standard equipment on the front seats and in 1979 on the rear seats too. Seat belts arrive at Mercedes-Benz in 1958. Fintail on the left with a single shoulder belt and a 220 ponton on the left with lap belts. In May 1948 Mercedes-Benz restarted its R&D work which had been interrupted by the Second World War. The focus was now on solutions for passive safety. 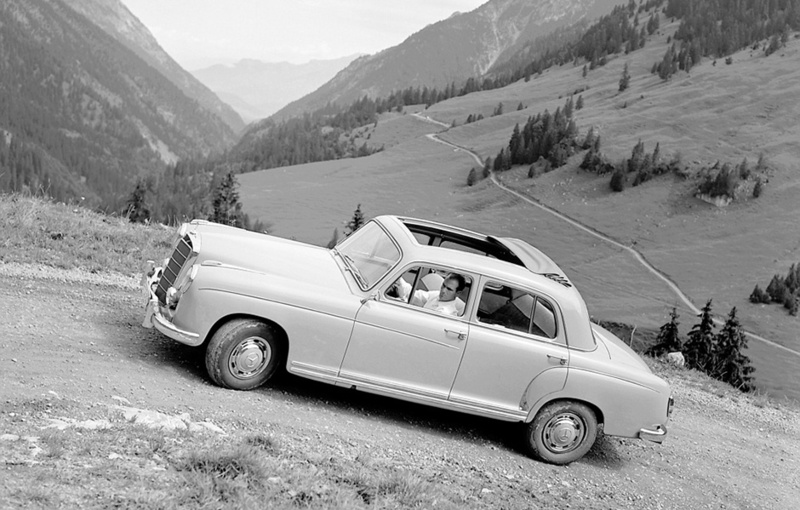 And solutions for ensuring driver fitness were also launched by the Stuttgart brand, as demonstrated in particular by the representational model 300 (internal designation 300 d, W 189) vehicles in 1958. The driver’s comfort was enhanced by the introduction of power steering and air conditioning systems. And this was also a contribution to relaxed, fatigue-free and therefore safe driving. The term “driver-fitness safety” was later coined for this. The ZF-Saginaw power-steering gear system was initially offered in the Mercedes-Benz 300 from March 1958 as an optional extra. The prerequisite for this was the version with automatic transmission. The representational vehicle known as the “Adenauer Mercedes” was thus the first Mercedes-Benz car with a power steering system. This was followed In December of the same year by an air conditioning system as an optional extra, also for the 300 model. It was offered as a “cooling system” and at that time mainly targeted customers in countries with a tropical climate. This comfort feature was priced at an additional charge of DM 3500 back then – almost as much as a Volkswagen “Beetle” fresh from the factory. A systematic culture of innovation at Mercedes-Benz also resulted in new technologies quickly becoming available in volume production. The 85 kW (115 hp) Mercedes-Benz 220 SE’s self-supporting chassis-body structure (W 128) with petrol injection was synonymous with this development. It was unveiled in September 1958. This technology for enhancing output and efficiency had already been established for some years by that time, and in this vehicle it now entered volume production at Mercedes-Benz. The additional charge compared with the 220 S with a carburettor (W 180) was DM 1900. Fuel injection became available in 1958 for the 128 series. This 220SE is on test in Germany and is fitted with the optional Webasto sliding roof. ← AMG GT 63 4MATIC+: Fastest 4-door in the world. Studebaker-Packard was of course the importer for Mercedes-Benz in all of N. America form 1958 through 1963. They begin offering seat belts in the 1956 Golden Hawk as a Dealer Installed accessory and followed that over the next two years with an improved belt suitable for the full line of car. At the New York Auto Show it was announced that the Seat Belts would be standard equipment in all passenger cars, becoming the first American manufacturer to do so. No doubt there was shared thinking between the two companies on this important safety item. I’ll add my take on the origin of the Seat belts so graphically shown in the photo above in the 1958 sedan. This was made by Alfred Baisch. and would have been available through Mercedes-Benz for installation in all 300SL’s as early as 1954. My 1955 Gullwing came with one installed for the driver.